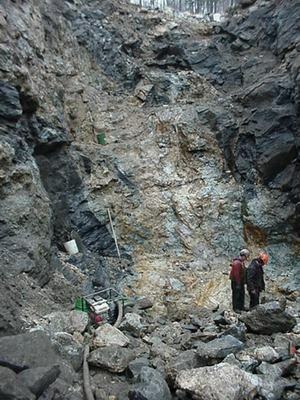 The photgraph above shows a view of the Orchard pegmatite taken April 8,2000. The Orchard is a dike body bounded on each side by gneiss/schist countrty rock. The dike at this point is about 20' wide and the width of the excavtion is 25'. Just above and to the right of the schist contact at the left, the remnants of the large schist floater can still be seen above the hoe handle. This schist floater appeared to play an important role in the formation of the Golden Beryl Pocket of '99. Directly above the heads of the two people in pit, a small schist intrusion can be seen. The pegmatite appears to bulge within the schist. The productive pocket zone is within this bulge as detailed in the diagram below. Again the schist appears to have formed and entrapment essential to the formation and preservation of the pocket zone. In the picture at the top right Doug Smith is pointing to the crystallization within this bulge. "Yesterday we sliced a 4' segment of our new bench to a depth of 8'. Expecting to see only the fine grain mixture of feldspar and metamorphozed(sp) schist, we were surprised to see a mineralization that we have not encountered before. This zone consisted of penney sized grains of glassy quartz with hard schorl xtals to 1' and abundant small glassy beryls of green and blue color. The bottom 2' of this bench, near bladey feldspar, many small vugs with apatites and q. xtals were evident. The lower portion of this bench is about 6' above and 8' up strike from the Golden beryl pocket of last July. It was difficult to properly examine this bottom region between continuous flooding and various equipment problems. Today we hope to give it a closer look." We did not in the slightest way anticipate bounty from this mineralization but we did detect its unique character for the Orchard Mine. This photo shows one of the later pockets from this zone. The original pocket is visible at the top. A rough schematic of the zone.